Share the post "Period After Uterine Artery Embolization"
Experiencing abnormally heavy periods? Feeling bloated? Find out how UAE can help eradicate these symptoms and help you get back to feeling great in no time! What will my period be like after UAE? In most cases, women that under UAE will have significantly lighter periods. Embolization does a wonderful job of ensuring that the symptoms prior to having the procedure are pacified quite markedly after the procedure. Therefore, women that have the procedure can feel secure in knowing that those painful and abnormally heavy periods will no longer be the case after the procedure. In some cases, however, some women may experience irregular periods from anywhere between 3 to 6 months. The chance of this is below 1% for women under 40 and about 10% for women over 45. Hormonal changes that may lead to period irregularity after a hysterectomy appear to be a bit more common than after UAE. Additionally, there are a few rare cases in which women have experienced early onset of menopause. However, early menopause is quite unlikely and in most cases has only occurred in women approaching the typical years of menopause onset. Overall, UAE is often the procedure of choice for most women due to a quick recovery period of only 5 to 7 days and its ability to completely eradicate irregular period symptoms. The procedure is less invasive than other traditional procedures and has the ability to get you back on your feet and back to your daily activities in a short period of time. 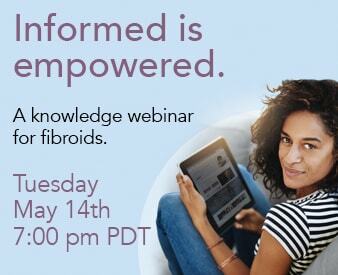 To learn more about fibroids and the embolization procedure, please feel free to contact the Fibroid Treatment Collective at 866-362-6463 or request a free phone consultation. We are always more than happy to provide you with useful resources and help you make positive choices for your help!